A crisp is one of my go-to desserts whenever I have friends over. I’ve never met anyone who doesn’t thoroughly enjoy a bowl of drippy warm fruit with a sweet and buttery crunchy topping. I have peach-blueberry and apricot-cherry on this site, but I mix and match fruit all the time. I love that crisps are mostly fruit and I love using whatever fruit is in season. They are super easy to make and can be prepped ahead in many ways. 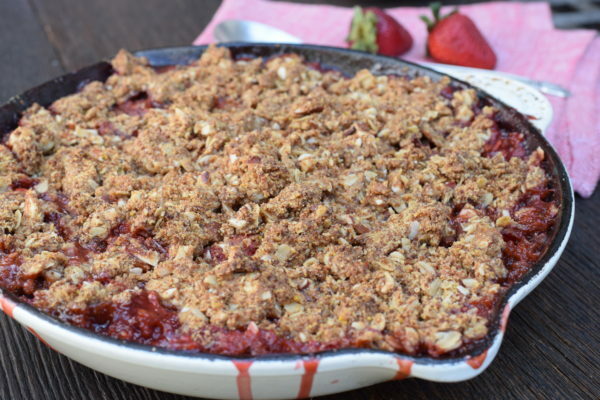 I came up with this strawberry-rhubarb crisp for my husband who absolutely loves that combo. He is also fond of cornmeal, especially underneath pizza crusts and bread where it provides a nice crunch. So I took my basic crisp topping and incorporated a little cornmeal and I do declare it was great. This topping can be swapped for any other crisp topping, no problem. But a lot of people are stumped about rhubarb. What is it? Rhubarb is technically a vegetable, but everyone thinks of it as a fruit because that’s how it’s usually cooked. 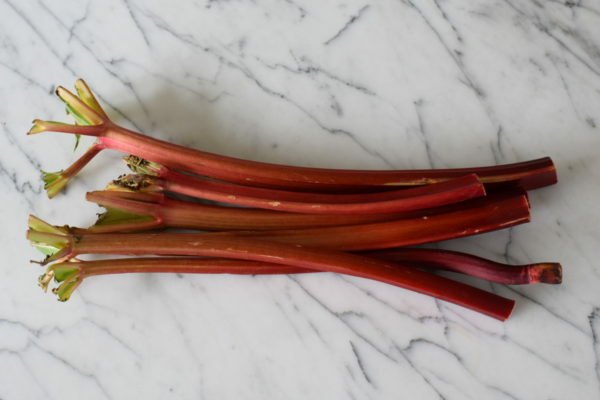 But rhubarb is actually quite tart and needs the help of a sweetener, or at least being paired with strawberries — the fruit that is always in season at the same time as rhubarb. 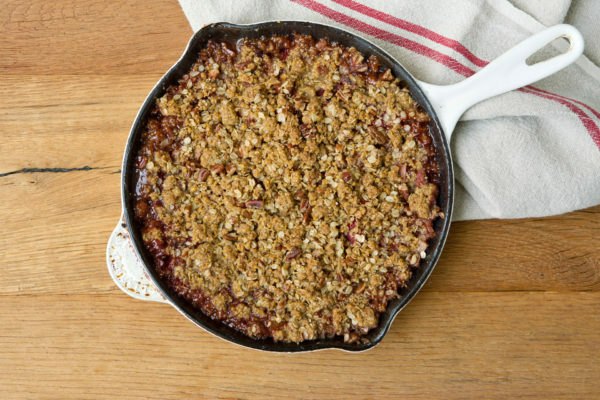 You’ll find rhubarb in grocery stores and at farmers markets sold by the stalk. The season is short, normally from April to June, but the last year os so, I have been seeing rhubarb from January through August. 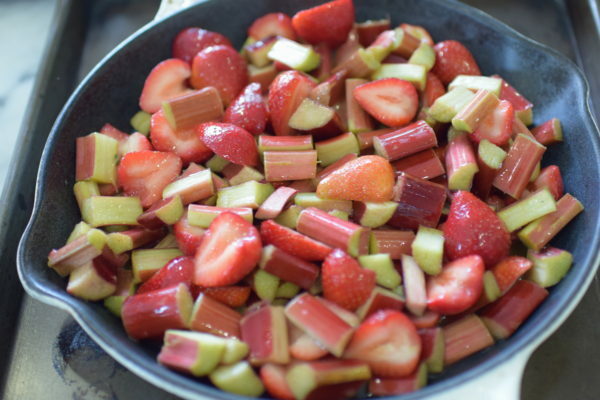 Rhubarb stalks are are bright pink on the outside, but they can also be light pink and even pale green on the inside. Whatever you do, only eat the stalks and not any leafy parts. The leaves are actually POISONOUS. Crisps are easy to master if you just remember that the filling must bubble before you remove it from the oven. That goes for a lot of fruit desserts, such as pies and cobblers. If the filling does not bubble, it will not thicken. 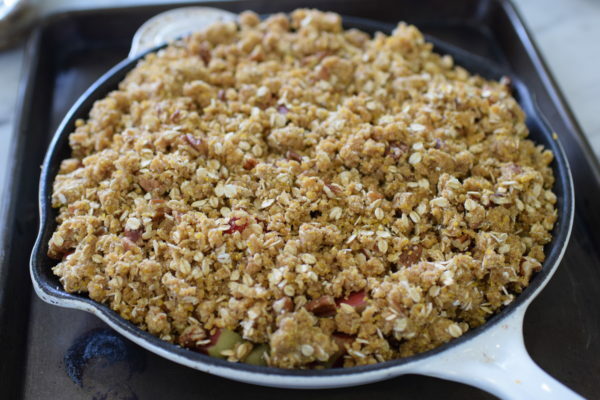 The crisp topping must be processed until it forms moist, not dry crumbs. Also, it is beneficial if the crisp can be allowed to rest at least an hour after being pulled out of the oven. The fruit will still hold onto heat, but you want the juices to settle and thicken up a bit. 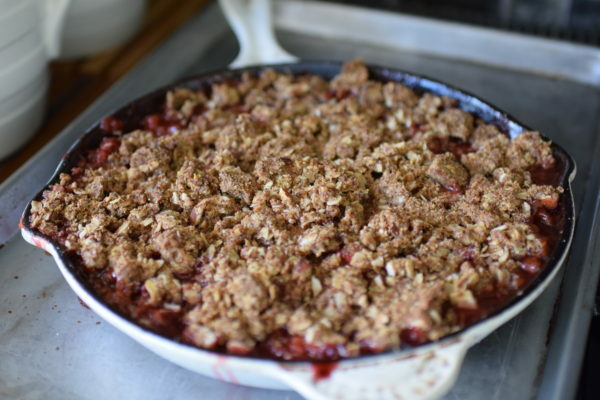 You can certainly bake a fruit crisp much earlier in the day and warm it through in the oven before you want to serve it. I was doubling this crisp in my classes and baking it in a 13 x 9-inch baking dish (positioned on a rimmed baking sheet to catch the inevitable drips.) 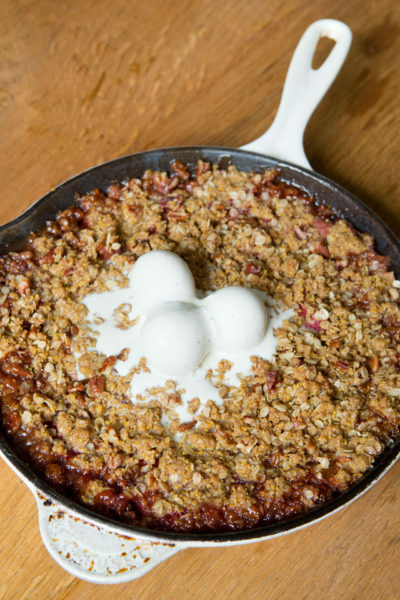 But my favorite way to bake and serve crisps is in a cast iron skillet. It’s so rustic and pretty. Just top it with a big scoop (or several small scoops) of ice cream in the middle and let everyone help themselves. I’ve never met anyone who turned that down. I thought this would be fun on Father’s Day or July 4th! Toss the fruit with syrup or sugar, arrowroot, ginger and orange juice. Transfer to an 8- or 9-inch baking dish or pie plate. Add all topping ingredients in the bowl of a mixer fitted with the paddle attachment. This can also be done by hand with a pastry blender. Blend until the mixture is no longer dry and can hold together when a small amount is squeezed in your hand. 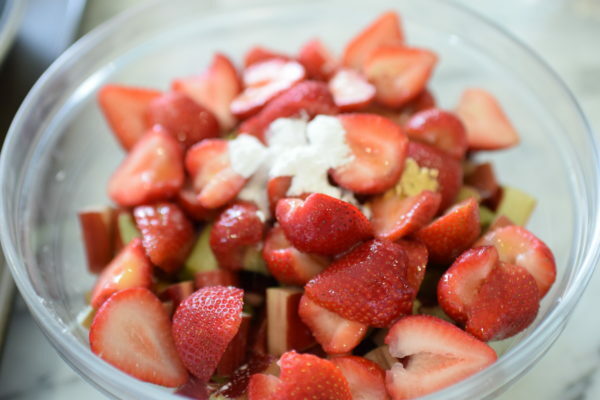 Topping can also be made ahead and refrigerated for up to 3 days or frozen for up to 3 months. Place baking dish on a cookie sheet and bake for about 45-50 minutes or until bubbly and topping is golden brown. *To double this, use ⅓ cup orange juice and bake in a 13 x 9 –inch baking dish for about an hour. I made this tonight using a different combination of fruits because I could not get any rhubarb. It was a total crowd pleaser! The topping is beyond delicious and I will definitely be keeping some in the freezer so I can bang out a winner dessert in no time at all. Thank you! Aren’t fruit crisps the best? Use what you’ve got and everyone will love it. Great idea to keep the topping in the freezer! You have to use some sort of thickening agent. You can use the same amount of cornstarch or use 3 Tablespoons of all-purpose flour. Enjoy! This looks amazing! Where do you get your Arrowroot powder and what brand? I’ve seen Bob’s Red Mill Arrowroot flour/starch. Is that the same thing? Yes! Same thing and that’s the brand I use. Much more natural than cornstarch!